Thank you to everyone who participated in the 2018 Operation Backpack® campaign! Your generosity has enabled us to help children living in shelters across New York City feel more like their housed peers and less like a child in need on their first day of school. We've updated our lists to reflect the needs of our 2019 campaign. Stay tuned for drop-off locations where you can donate a full backpack! Every backpack given to a child through Operation Backpack® is filled with brand new school supplies according to the child's grade, so that these children look and feel just like their classmates. For example, high-schoolers get a dictionary and a scientific calculator, while the youngest children receive watercolor paint sets, washable markers and drawing pads. Children preparing to take geometry receive a protractor, compass and graph paper. We have compiled lists to make your shopping easier! There are four grade-specific supply lists linked below (updated for 2019). Please consider donating a filled backpack or two. Choose a grade, download the supply list and go shopping! We ask that you label it with the appropriate grade and note on the label if any supplies are missing. We spend a lot of time curating these lists to make sure every child has what they need, so please stick to the list as closely as possible. Thank you! If you have children of your own, engage them in the process. We are always in need of certain supplies and would particularly appreciate donations of academic planners, calculators, USB flash drives and subject dividers. Please consider adopting a product. 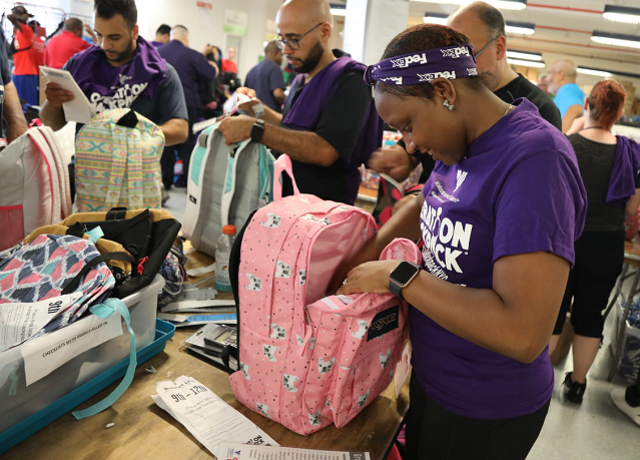 If you would like to organize an Operation Backpack® drive at your company, school or place of worship, please email us at azibell@voa-gny.org.